In 1974, Richard Nixon ordered the abolishment of the running compilation of groups considered as subversive and threats to the American way of life referred to as the Attorney General’s List of Subversive Organisations (AGLOSO) that was created in 1947 at the behest of the Harry S Truman administration to deflect increasingly vocal criticism by Republicans that the Democrats were tolerant of communists. 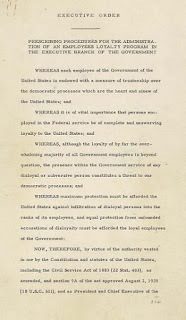 One prong of the programme and image-campaign, it was drawn up after Truman issued an executive order that established a national litmus test for the leanings and loyalties of federal employees. Another tine provided for the establishment of a Loyalty Review Board to counter the reflex for a witch-hunt or purge by those deputised with the power of confirming and conferring allegiance. Screening could be conducted in the background and netted three hundred certifiable security risks out of three million workers. 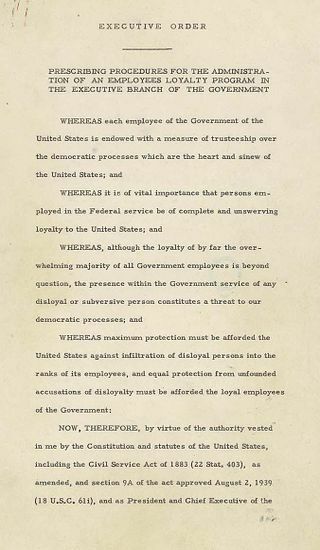 Though the decree was repealed by Eisenhower six years later—in deed but perhaps not in spirit—it’s immediate successor was the House Un-American Activities Committee and the impugning investigations that the original intent sought to avoid, recognising the danger of staffing a government from top to bottom with those with undeviating political views.